Lens Description: The Schneider 43mm f/5.6 Apo-Digitar XL SES is an ultra high quality moderate wide angle lens designed to maximize the capabilities of adjustable cameras with larger image digital backs such as Phase One, Leaf and Hasselblad that have sensor sizes up to 53.7 x 40.3mm. The electronic shutter offers numerous advantages over standard analog mechanical shutters. Most importantly, it\'s more precise, offering shutter speeds in finer increments with unmatched repeatability. 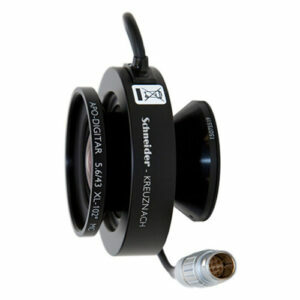 It also offers remote control features via a connected computer not possible with traditional shutters.rnrnThe 43mm f/5.6 Apo-Digitar SES is expressly designed for digital imaging and discerning photographers who wish to use its large image circle to correct perspective and avoid image degradation in post-production.